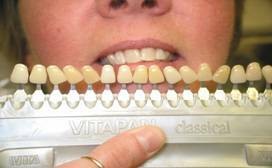 Frequently the patient’s teeth may not match one of the shading chips. Teeth are not one color. 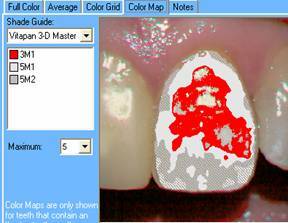 Often there are variations where one section of the tooth is a different color than other areas. To match perfectly these characterizations must be reproduced in the final crown or veneer. 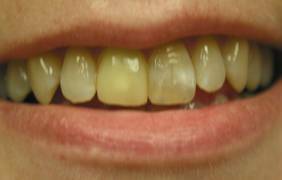 The old crown on patient’s right side does not match the color or characterization of her natural teeth. Our office is dedicated to ultimate esthetics using every new technology available. We use a computerized shading system that eliminates the difficulties in matching your new restoration. 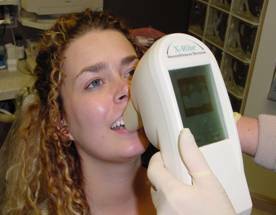 With this system the color of your teeth is scanned into the computer by the same sophisticated colorimeter used in industry, including all of the natural variations and characterization. 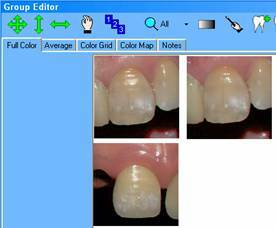 The information is then emailed to DaVinci Dental Laboratory (our office is part of the “Extreme Team” as seen on ABC-TV’s “Extreme Makeover”) where the skilled ceramist uses the same software to reproduce your natural teeth in porcelain. The result is a spectacular color match that you will be proud to smile about.